Scarves, hats, gloves, jackets, boots, and sweaters are just part of our daily wardrobes. And I for one, absolutely love it. I know, I know. A true Southern belle loves summer time and Southeast weather and temps in the 80s and 90s, and I do love all those things, but I also really love the cold too. It makes me feel alive and everything feels clean and bright and I breathe so much easier. And this winter I am in love with sweaters with belled, billowy sleeves, chunky, oversize cable knit sweaters, “moto” boots and ankle boots with buckles and other unique details, suede, classic pom pom beanies, and worn-in leather jackets. I purchased a Vegan Leather Bomber jacket from Anthro about this time last year and I find that I am even more in love with it this year than I was when I bought it. Always handy to have a few leather jackets in your closet. Dress them up, dress them down, perfect for any occasion from work to play and everything in between. And for something a little more utilitarian, I love an anorak. This Geneva Anorak in classic olive green is a bit longer than some others I have seen, and I love the length of it, hitting at the hip rather than nipping in at the waist. And, bonus!, it has really beautiful details and stitching. And for an all-weather, all-temperatures coat, this Land’s End Won’t Let you Down Parka gets all the highest marks! It is made of ultrasoft down that won’t lose its fluff or loft and will keep you warm even in -25 degrees! Pictured below in Midnight Teal. Starting at $179 and up to $199, depending on size. A classic snowy, light grey wool sweater updated with chic bell sleeves is the perfect pull over for this time of year. Nothing cozier than an over sized cable knit tunic over jeans or leggings this time of year. Pictured above in Sandshell, but is also available in a delicious shade of steely blue. And can we talk about this sweater with the amazing bow/tie detail around the wrist? How beautiful is that! 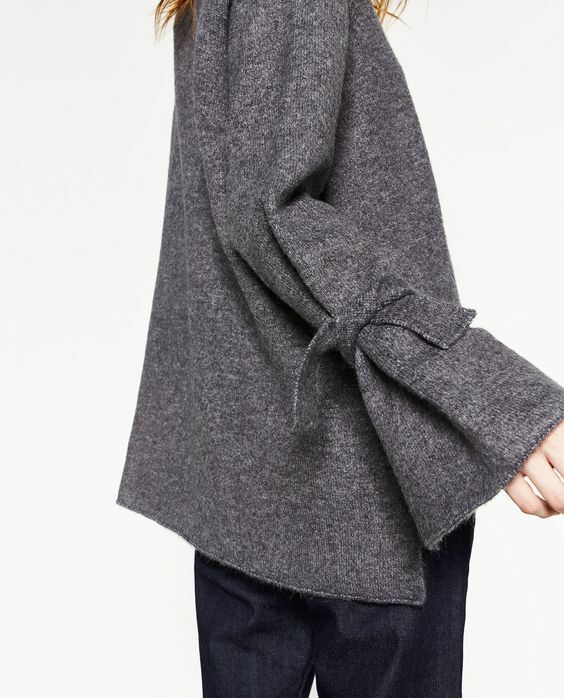 This is a ZARA Sweater with Tie Sleeves and is just $49! Also love it in this Charcoal Heathered color. 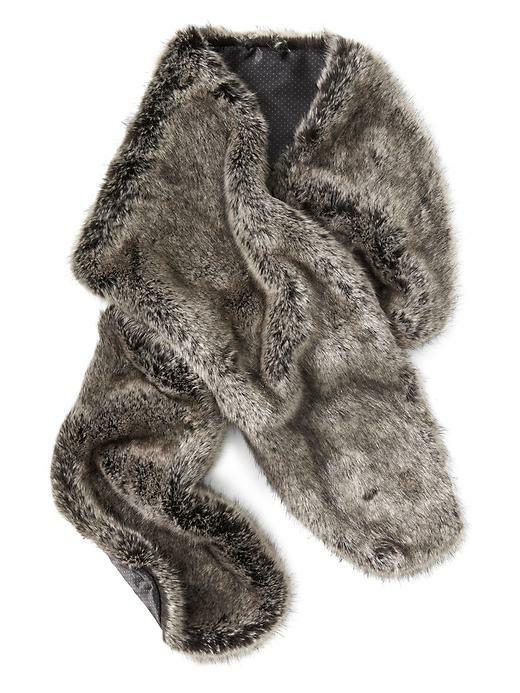 Fur accessories are always a classic- or faux fur in my case, and this Faux Rabbit Fur Scarf from Banana Republic for $78 is perfectly luxurious to wrap up in. Comes in 3 different textures and colors. “Mink Grey” pictured above. Or maybe a Faux Fur Vest? I may have at least one of these hanging around my closet and they are a workhorse for me this time of year. So versatile! This one is a Faux-Fox Fur Vest by Sanctuary for $188. I love the length of it being a little longer and hitting paste the hips rather than at the waist. A more substantial piece of outerwear. And that creamy amber color is just yummy! And a yummy, crystal blue faux fur cowl for just $58?!? Sign me up! The perfect throw-on-and-go winter accessory is a cowl. I own one similar to this in a textured cream and it is just lovely and I love the way if feels up around my face and neck. And ones with a bow?!? An even bigger win. Classic Leather Gloves and Bow Gloves, both from Banana Republic from $61.99. And for headgear? It’s really hard to beat a classic Pommed Beanie for me, and here are a few of my favorites! And this one even has sequins for added glam. Or for something with a little more structure and style, try a Beret. I also really love head wraps and headbands for this time of year and they don’t mess your hair up near as much as a hat, so added bonus! Or if you have your hair in a cute updo, it’s the perfect cold-weather accessory for that as well. These are Marled Knit Heabands (or Earbands) for just $24.95. Comes in assorted green, copper, and gray. I am absolutely obsessed with Ankle Boots, and these “Snare” boots from Seychelles are such a classic cut with deep V slits on either side, but made modern with an ultra glam, Metallic finish. I have a pair of Snare boots in Ivory and I wore them all summer, fall, and now even into winter as well. Also comes in black, navy, taupe, and tan for $140. And the more you wear them, the more worn-in the leather appears, the better these shoes look! I have some that are 4 & 5 years old and still get compliments! Take a “walk on the wild side” of things this winter in Seychelles Wake Booties in Snake Skin. These are originally priced at $148. And these? These beauties are absolutely splurge-worthy! I love the rich, ruby color and the ankle straps and buckles. These Hudson Horrigan Harness Booties are handmade leather boots made in Portugal and are $222.60. And they are absolutely yummy! So, I hope you found something on that list that struck your fancy and will also keep you warm and cozy, inside and out! Happy winter-ing & most of all Merry Christmas to you and yours! I have shared a couple of classic cookie recipes with you that my family has enjoyed at Christmastime for many years. Traditions that are time-honored and are incredibly nostalgic for me this time of year. I love that they remind of us of those we may have lost. Memories that we cherish. Moments that have been lost in time that we can recall and smile. And, along with keeping the traditions that have been passed along to me, several years ago, I started my own holiday tradition. And so, for the last 6 years, every December, I have made classic Chocolate Fudge with toasted pecans for my coworkers. They start asking about the fudge by end of October, ensuring that it is still on my holiday to-do list in early to mid December. I use a classic, old-time recipe for Chocolate Cheese Fudge. And yes, I know what you are thinking… Cheese?!? No one can believe how delicious and insanely creamy this homemade fudge is, and furthermore, no one can guess what secret ingredient makes it so… Velveeta! So, before you judge this recipe, whip up a batch of this Chocolate Cheese Fudge for yourself and share with the ones you love. Or enjoy a plate of it all for yourself. It’s the holiday season after all and they don’t call it “the most wonderful time of the year” for nothing! Spray lightly the bottom of a 9 by 2-inch square pan with a nonstick spray. You won’t need too much, there is plenty of delicious butter in the fudge itself. In a saucepan over medium heat, melt the cheese and butter together, stirring constantly until smooth. Remove from heat and add the vanilla and nuts.Stir to combine. In a large bowl, whisk together the powdered sugar and cocoa until thoroughly blended and light. This was just one box of powdered sugar of many. Very, very many. Pour the cheese mixture into the sugar and cocoa mixture and stir until completely mixed. The candy will be very stiff. Using your hands, remove candy from bowl and press evenly and firmly into pan. Because of the amount of butter in this recipe, pat the top of the candy with a paper towel to remove the excess oil. Place pan in refrigerator until candy is firm. To serve candy, cut into blocks or squares. Airtight and wrapped up ready for distribution. For personalized gifts, I cut into 4 equal, large squares (if using a 8×8 or 9×9 square pan), wrap in cling wrap, and tie with a beautiful bow, a gift tag, or even a tree ornament for extra flourish. They look absolutely irresistible, if you ask me! Who wouldn’t love that as a Christmas gift? The perfect gifts are always when you give of yourself. Homemade gifts are thoughtful, warm, and comforting.